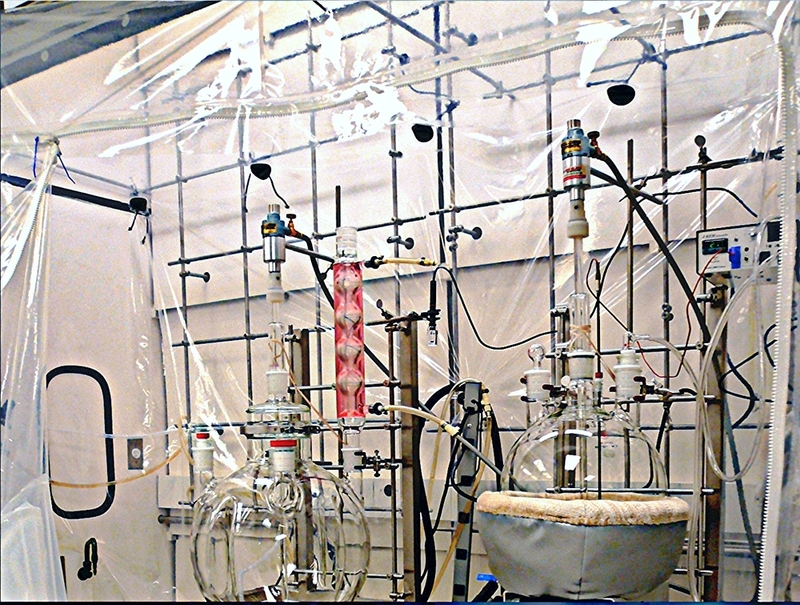 Laboratory Hoods were too small to allow for unloading of a movable filter dryer. A flexible enclosure was created that allowed for removal of product from the dryer, final drying in a vacuum oven, and packaging before removing the product from the enclosure. All equipment exteriors were cleaned in place. Complete replacement of need for a laboratory hood is achieved using appropriate absorption cartridges to scrub off-gases. The door opens within the enclosure for fully contained access. When product drying is complete, the trays are withdrawn, placed on the table, and product transferred to a final package. The final packages are over-packed using a bag-out sleeve. The filter dryer, vacuum dryer oven face , and any supplementary equipment ad tools are cleaned using the fog/mist procedure before removing. The enclosure is then collapsed and incinerated. The filter/dryer is shown inside the enclosure. The operator has just opened it and is starting to transfer product to the dryer trays. 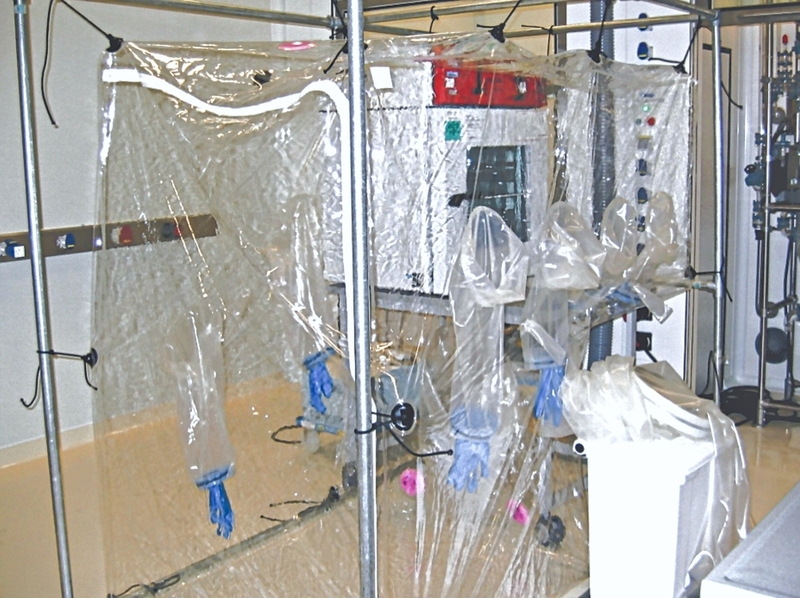 Replacing the need for laboratory hoods, and enhancing the performance of both bench and walk-in hoods, are ideal applications for flexible enclosures and glovebags. Cart mounted glovebags add mobility and movement within and between laboratories, in addition to extending the workspace. Since flexible enclosures are clean upon arrival, no cleaning and validation is necessary. Many off-gases can be scrubbed using appropriate absorption cartridges. 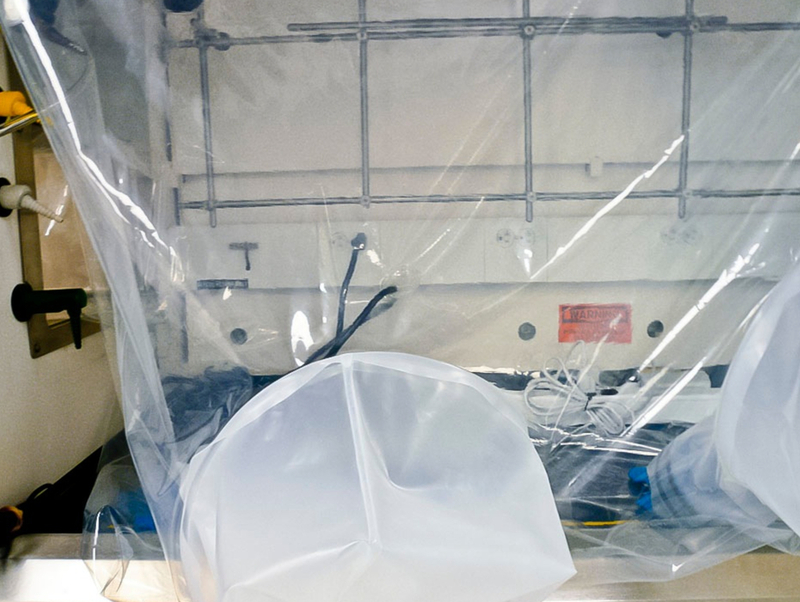 Introducing a flexible Glovebag into the working space it can be used for high potency materials handling making use of an otherwise limited installation. The flexible front of the Glovebag combined with the full frontal opening of the exhaust hood provides a wide manipulation range for the personnel. The contained pass-through allowed for product transfer both ways. Material is received from the processing step and transferred to dryer trays which are then placed in the vacuum dryer (accessible within the enclosure). After drying the product trays are unloaded at the benchtop, product yield weighed, and final packaged before returning through the rigid pass-through for final transfer out through the double airlock. The vacuum dryer is mounted within the enclosure and fully accessible for loading and unloading within the containment. Laboratory equipment arrives in random sizes, with each piece having its own unique set of utilities, e.g. electrical power, cooling water, airflow, computer hook-up cables, etc. All of these are delivered through sealed pass-throughs. Enclosures can also be mounted to rigid door frames for access. Room lighting provides visibility. Internal temperatures can be tolerated up to 180F continuous and 200F transient. Many off-gases can be scrubbed using appropriate absorption cartridges. This rear view shows the supplementary frame support which prevents the flexible containment from collapsing due to the exhaust. Utilities enter the enclosure through sealed pass-throughs. Flexible solutions design and installation are virtually unlimited. Small benchtop equipment can be used without compromises to access and performance. Enclosure sizing can range from small benchtop to full-scale laboratory containment. In all cases, lighting is provided by ambient light levels, film clarity provides unrestricted viewing, and multiple glovesleeves can allow complete access to the contents. Cost is low and disposal is easy and safe.